It is teachers with access to technology that will make the difference. This work is entirely achievable, but it will require cultural change and will be difficult at times. It will require us to focus on a small number of ambitious goals and make the integration of technology the daily agenda. Please use the resources below to deepen your understanding of Blended Learning as we begin this journey together in DMPS! Dreambox gives an introduction to blended learning by offering rationale and benefits to incorporating this model into our education system. Principals and coaches explored this article in depth at the Marth 2014 Teaching and Learning meeting. 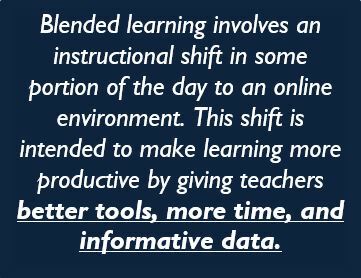 This article found on http://WWW.INNOSIGHTINSTITUTE.ORG offers an introduction to Blended Learning, gives a precise definition, as well as explores the various models that are currently associated with Blended Learning. Summer PD 2014 participants were given a chance to explore this article in depth and apply our new math curriculum resources to the ideas presented here. This lively, interactive, 5 module course has been designed for educators who would like to learn new ways to become even more effective when implementing technology into their classroom and teaching practice. Each research-based module, which will take about an hour to complete, contains a rich variety of multimedia learning activities and resources including videos, surveys and links to additional readings. The Microsoft Educator Network offers training training resources, articles about technology in the classroom, and much more. Explore the resources here by navigating from the top banner. You'll find many resources here that can be easily implemented in your classroom. Project Red is gathering together visionary district leaders and teachers to implement technology based upon the Project RED method. This group conducted the first and only national study of education technology to focus on student achievement and financial implications. In their research of nearly 1,000 schools, they discovered a replicable design for successfully introducing technology into the classroom- one that leads to improved student performance and cost benefits. Sign up for the Project RED Community to gain access to exclusive webinars, institutes, resources and support. SMART Tech offers many resources for training on the SMART Notebook 2014 software. Search by question or topic area to get the help you need. Math Adoption Building Status- check here to see the status of your building regarding interactive projector installation. Instructions for downloading SMART Notebook 14- Use this information to install SMART Notebook 14 on your district laptop. You must be on the DMPS district network in order to complete the installation process. Please email CSD@dmschools.org or call 242-8161 if you have trouble with installation.